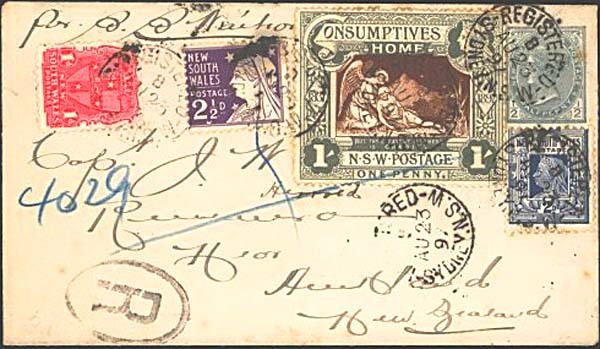 The 1897 Consumptives Home issue of New South Wales - the 1d (1/-) on cover. In 1897, the cost of posting a local letter to a destination within 15 miles was 1d - hence the basic denomination in the set. That stamp cost 1/- to the purchaser with the balance of 11d going to the Consumptives Home fund. 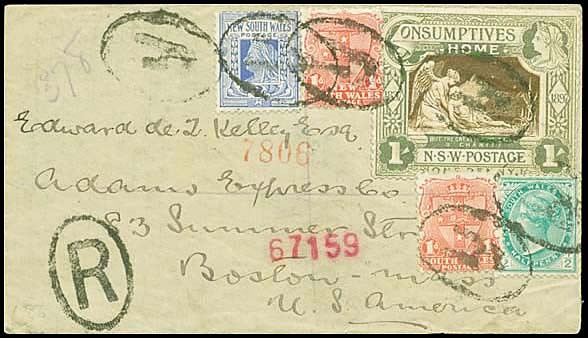 The nature of the issue, with the high relative cost of the stamp, led to most covers being used in contrived ways. 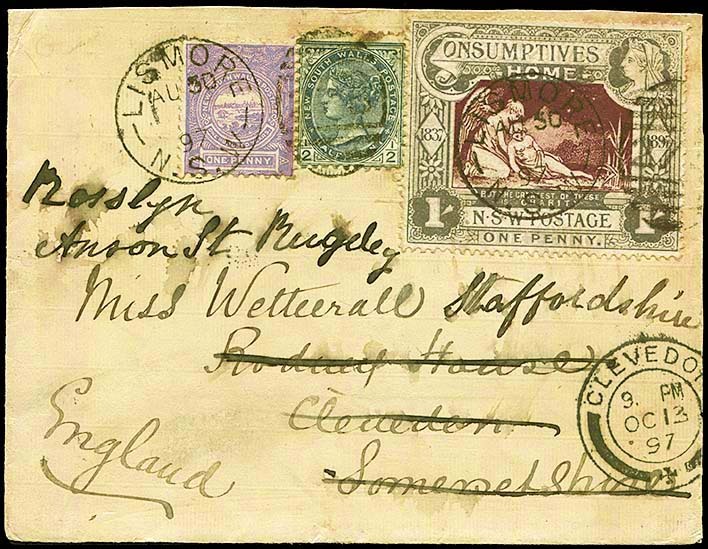 Sometimes, however, it is difficult to determine if a cover is philatelic or a genuine postal article. Summary table of the known mixed frankings of the 1d (1/-) Charity stamp. Three probable First Day Covers are known for the 1d (1/-) stamp although they have, until this website, been unrecognised or misclassified. For example, one description of the Shaw cover below gave it the date stamp of July 22. Park Street 1 and 924 duplex for local delivery to Mr. W Shaw. Prestige Philately August 2012 Lot 265. The above cover - albeit it philatelic - appears to be a genuine First Day Cover. the cover has been torn from the top to between the first two initials (M and W). The parallel 2½d (2/6) cover raises some questions especially about the first date of issue. Provenance: Mike Berry, Johnstone. The only recorded First Day Cover franked with a Charity pair. 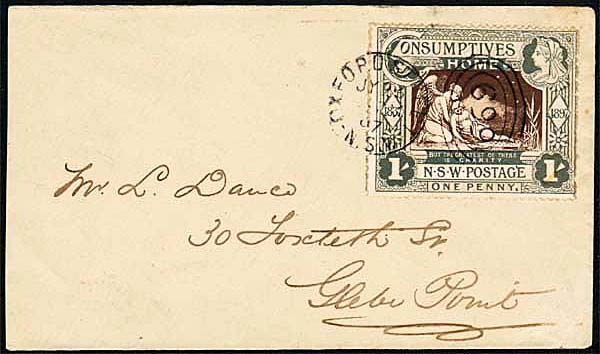 Covers with a single 1d franking were popular and involved less risk to the collector. There are probably about 30 such covers (listed separately) with 20 definitely confirmed so far. At least four of the known covers went to the same address in Glebe Point - although to three different recipients. Local letter to Enmore (Barry Co). 30 June 1897 with very faint Barred Numeral 1204 of Enmore. Local letter rate within Sydney. Cancelled and well tied to cover with a 699 duplex of Oxford Street. Oxford Street to Glebe Point. Cancelled with a 699 duplex of Oxford Street. Similar covers to the same person but with lighter cancellations have been listed on Ebay (for 23 July 1897) and by Prestige Philately August 2012 Lot 258. Levick at Longueville on 23 October 1898 (?). See also the hand writing on the Glebe Point cover below. Clearly these covers were philatelic in nature and there are many similar covers to the same Glebe Point address. Local letter rate to Adelong. Adelong 235 Rays duplex (3R16). Provenance: Chartwell Collection (Spink May 2018, Lot 64). Local letter to Broken Hill. 2 September 1897 - just out of postal validity. 3 September 1897 - just out of postal validity. See the hand writing on a previous Glebe cover also. the almost identical covers of 30 August 1897 and 31 August 1897 to H. B. Bilborough cancelled at Haymarket with the Barred Numeral 865 inverted. List of covers with single frankings of the 1d (1/-) stamp. Prestige August 2012 Lot 265. - P and a of PARK do not link ). 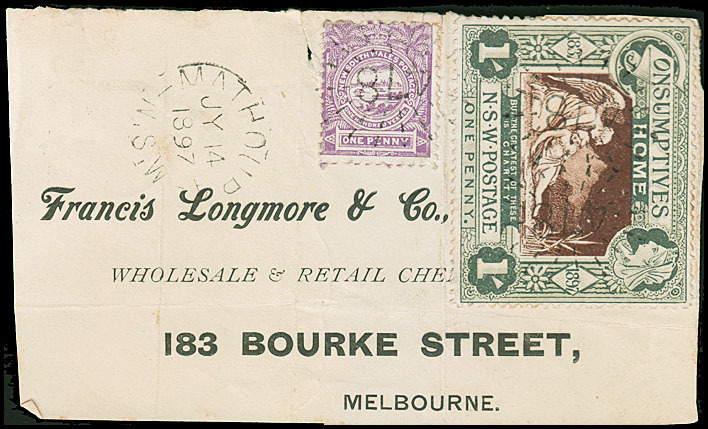 (cover to Bilborough - date stamp touches base of 1/- frame). Stanley Gibbons Oct 2017. (at 5:30 pm). Sydney NSW duplex. (cover to Osclaz PO Box 1384). Corinphila May 2018 Lot 1940. 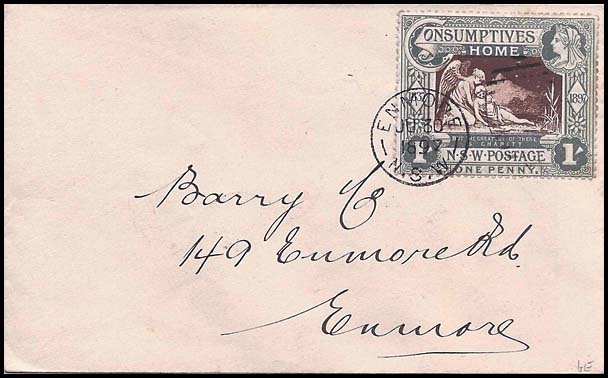 30 June 1897 Enmore Enmore (to Barry Co). Date stamp covers lower left corner of the stamp. Faint duplex on stamp. Ebay March 2017. (699 duplex) City Ebay August 2013. (193 duplex) Ashfield to Master J. F. Stephen. Ebay Dec 2017 (techgifts). (699 duplex) Glebe Point (to Mr Danco). 23 July 1897 George Street West duplex Glebe Point Ebay October 2014. 26 July 1897 Adelong Adelong (to Eissler Esq). Ebay May 2014. George Street North (to W. C. Platts). Flap has oval The London Bank of Australia. Ebay April 2018 (techgifts). 30 July 1897 Enmore Newtown Nutmeg September 2006 Lot 4866. (1127 duplex). Hurstville (cover to T. Leeder). Prestige August 2013 Lot 359. 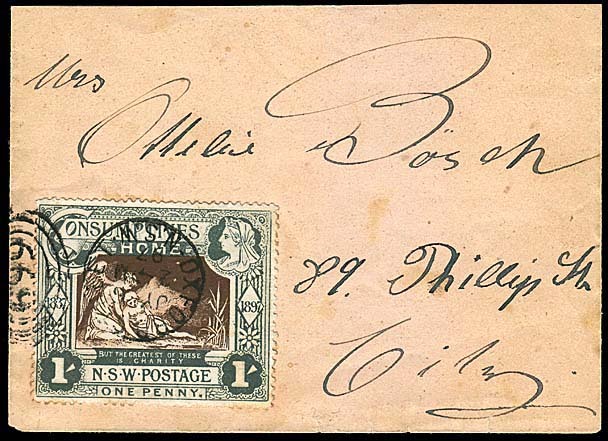 25 August 1897 Edgecliff Addressed to Mr. C. A. Gilles at Edgecliff PO. Single with selvedge to right and below on plain envelope. Ebay March 2018. (inverted 865 duplex at 12:50 pm). Haymarket (cover to Bilborough - date stamp touches lower frame). Stanley Gibbons Oct 2017. (inverted 865 duplex at 12:50 pm). 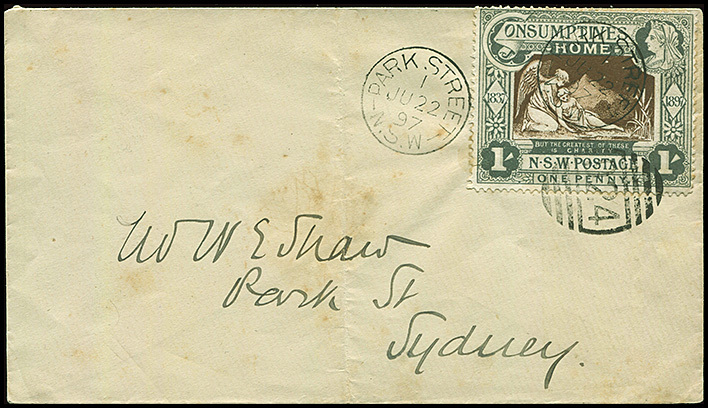 Haymarket (cover to Bilborough - date stamp touches base of 1/- frame and extends beyond the LH perforations). Corinphila November 2017 Lot 6127. Beyond postal validity of 31 August 1897. 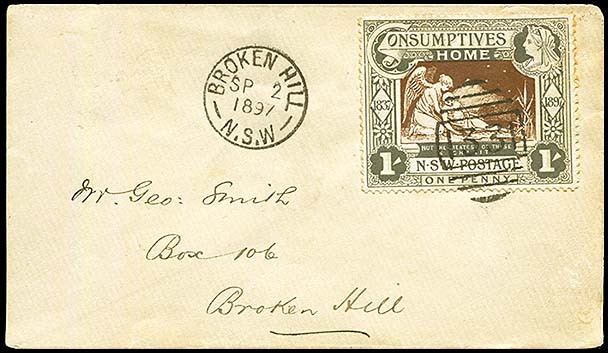 (1331 duplex) Broken Hill (cover to Mr. Geo. Smith). Spink May 2018, Lot 64.
two covers with pairs of only the 1d (1/-) stamp - one local cover (no details available) and one to Melbourne (see below). 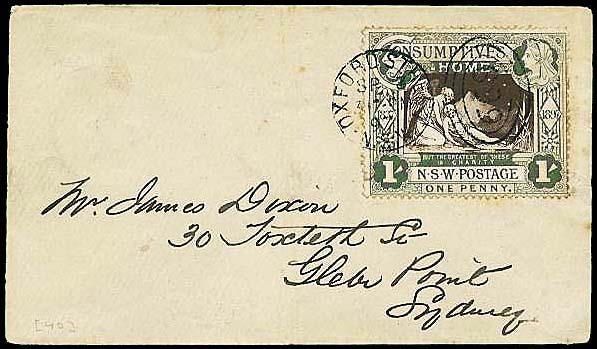 one cover was sent to Brisbane with two single 1d (1/-) stamps. the most significant cover with a multiple is a combination franking with both of the Charity stamps in pairs. 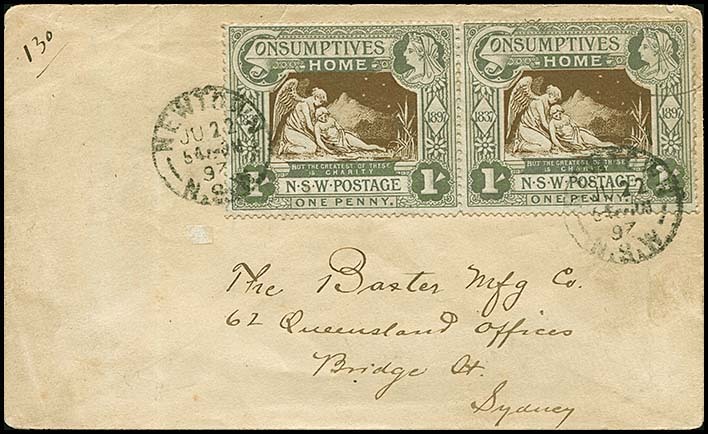 (NSW duplex of 16 December 1904). One of two recorded 1d (1/-) covers franked with a pair. Status February 2003 Lot 1302. Used seven years after issue. Rod Perry, in his research of the philatelic records of early stamp dealers, notes that C. B. Donne was Melbourne's first Stamp Dealer. Mixed franking with the 1d (1/-) stamp. Thirteen covers are recorded with a mixed franking involving the 1d (1/-) stamp and other stamps (excluding the 2½d). Of these, four were sent to Queensland, one to Victoria and four were sent overseas. See below for a list of the mixed franking covers recorded. Provenance: David Wild. 1d local letter rate. (duplex 184 of 3 July 1897). Mixed franking with 1d NSW Coat of Arms. Duplex does not extend beyond the Charity stamp and Arms not quite touched by cancellation. 1d Arms overpays the local letter rate. Grosvenor (UK) 20 September 2017, Lot 294. 4d registered local letter rate. 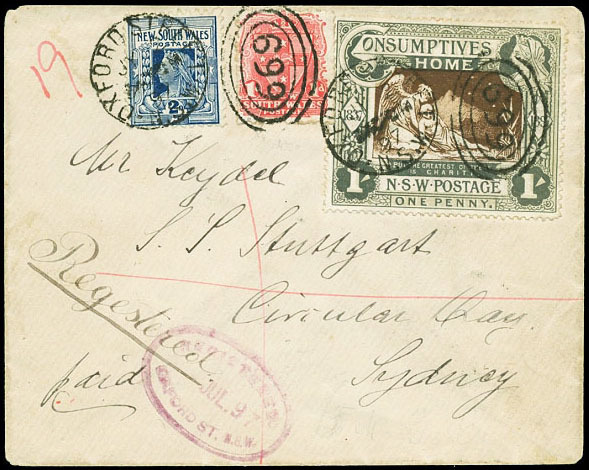 Sydney (Registered) for local delivery 8 July 1897. The 1d (1/-) Charity stam[ is not tied to the cover. The 3d green Diadem pays the registration fee. 4d local registered letter rate. Oxford Street to the S. S. Stuttgart at Circular Quay. 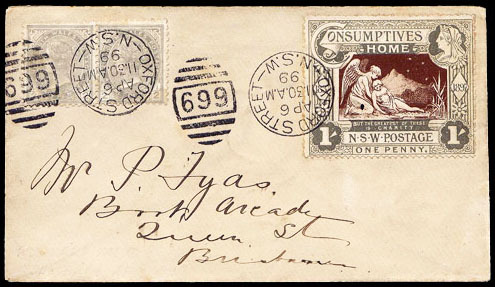 9 July 1897 (oval numeral 699 duplex). In combination with 1d Arms and 2d Queen Victoria from the Jubilee issue. Has registration number 19. See corresponding cover in 2½d Covers page (Combination). (duplex 478 of 14 July 1897). 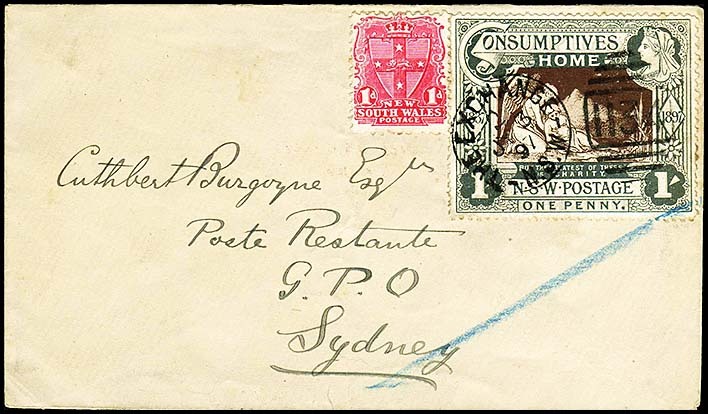 Mixed franking on a cut-down cover front with 1d View of Sydney Centennial. (cds of 21 July 1897). Mixed franking with 1d Arms. Similar handwriting to covers 2 and 3 above with single franking. to Mr Parry (same handwriting as above and or this cover) uprated with 1d Arms - Goulburn to Glebe Point, 7 August 1897. In combination with four other denominations. Hence probably philatelic but correct rate paid and to an international destination with arrival backstamps. Provenance: Mike Berry, Johnstone. 2½d foreign letter rate. The day before the postal validity ended). Has a date stamp on the front and a backstamp of Clevedon of 13 October 1897 and an additional backstamp of ?u?eley of 14 October. Has a 1d violet Centennial and a ½d grey uprating the Charity stamp. Posted after validity of stamps for postage ended (31 August 1897). 6 April 1899 (669 duplex). In combination with a ½d grey pair. Millennium Auctions February 2005 Lot 74. (posted 9 years after the period of postal validity). 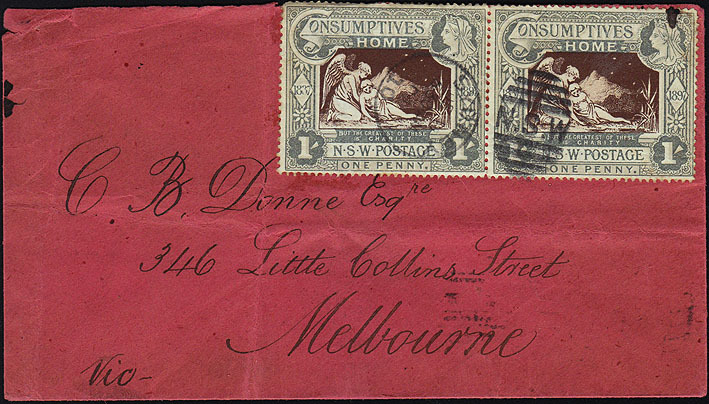 1897 Consumptives Home 1d (1/-) with ½d green, 1d Arms x2 and QV 2d paying the correct rate of 2½d + 3d registration. Prestige Sale 175 August 2012 Lot 267. Mixed franking covers including the 1d (1/-) NSW Charity. 8 July1897 Sydney Registered Sydney (Mr Pope) 3d green diadem Millennium September 2013 Lot 139. (S.S. Stuttgart) 1d and 2d Jubilee Prestige April 2009 Lot 354. 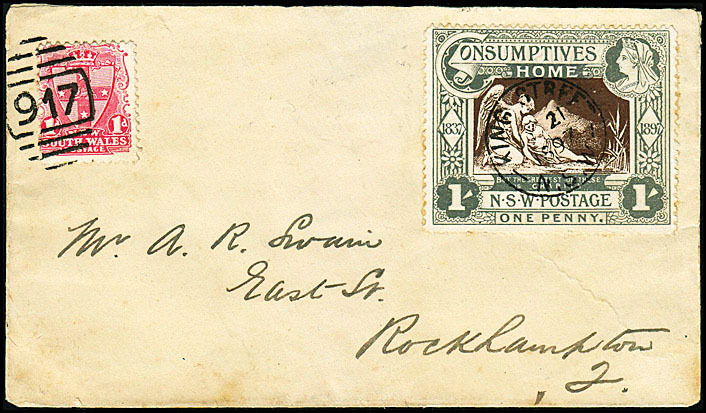 21 July 1897 King Street Rockhampton, Qld 1d Arms Status December 2002 Lot 1016. 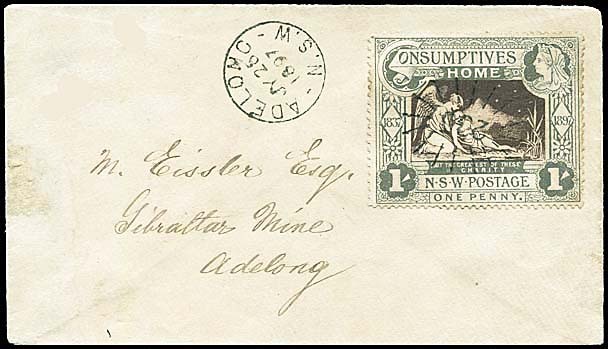 23 July 1897 Oxford Street dup Rockhampton, Qld 2 × ½d grey Prestige August 2012 Lot 258. 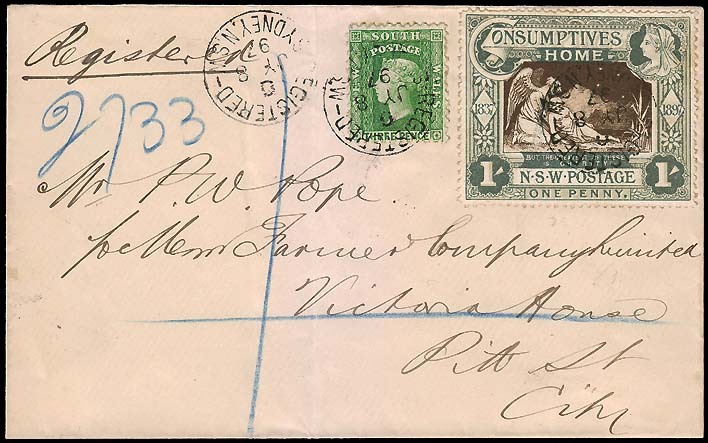 23 August 1897 Sydney Reg'd Auckland, NZ ½d, 1d, 2d & 2½d, Prestige May 2007 Lot 134. 30 August 1897 Lismore Clevedon, UK ½d grey & 1d Centennial. Mike Berry, September 2017. 6 April 1899 Oxford Street duplex 669 (posted 11:30 am). Brisbane (to Mr. Fyas) ½d grey pair Millennium February 2005 Lot 74. 28 July 1906 Sydney Registered Boston, USA. Addressed to Edward Keller at Adams Express Company. ½d, 1d (2 Arms) and 2d Jubilee. Prestige August 2012 Lot 267. No date Enfield "189" rays Toowoomba, Qld 1d Arms Matthew Bennett Feb 2003 Lot 562.